When it gets dark and quiet, and all the world sleeps, I am awake. I look out my window and see the moon, almost full and almost bright, illuminating the passing clouds and shining down on my street, my house, and my cricket. The cricket sings outside my bedroom window and in the middle-night hours when my children sleep soundly in a tangle of Thomas the Train sheets and matchbox cars, I think about the moon and my cricket. Have you noticed in the darkness there is light? Have you noticed the silence of night has a song? There’s comfort in the moon and the cricket. 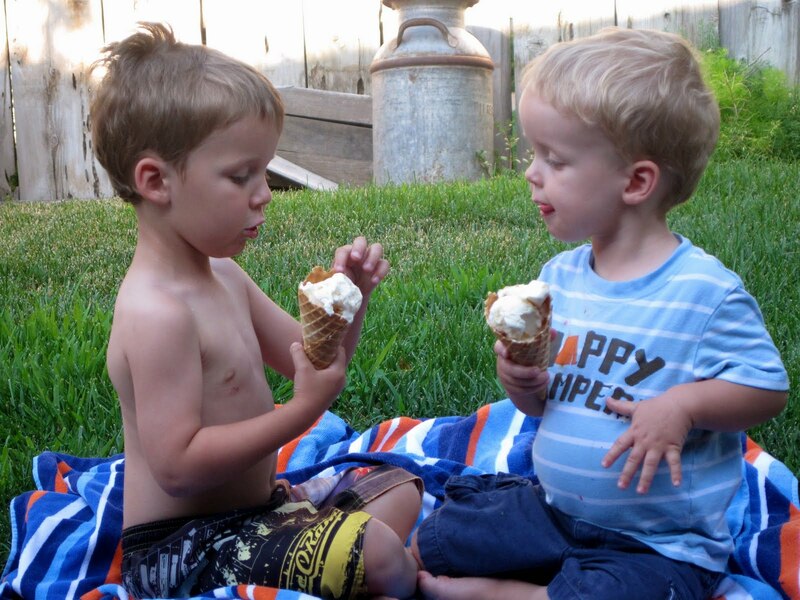 I took a picture after dinner, of two boys eating peach ice cream. Peach ice cream with your brother belongs with the cricket and the moon, and hope is two little boys with summer tans and skinned knees on beach towel covered grass. This world can be the blackest night but a light still shines in the darkness. A song is still sung, worshiping the One who is for peach ice cream and brothers, for crickets, and for moonshine on clouds. In this belief I tuck my kids in, around their match box cars, and pray over the newspaper. 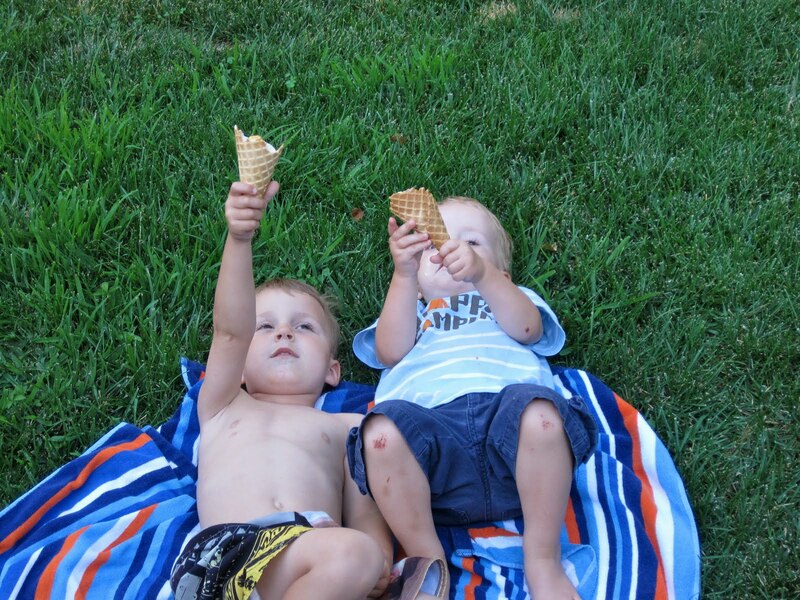 I raise my ice cream cone to the sky and say thank you, because thank you is all one can say…even in the night. Deep sigh. This is just beautiful. i wanna write like you when I grow up. You're right, and He is for all those things. And also, I pray, for a scaredy-cat writing something to share with 57 women on Saturday. Reading this made a lump rise up in my throat, and I know you're just the person to ask: please pray for me. Happy National Ice Cream Day! We should all lift cones to the sky and give thanks. What a lovely post! you are a poet. Thank you. Wonderfully beautiful, my amazing friend. Thanking Him for that light that shines in the darkness! And through cancer and car accidents and parents missing their kids. So appreciate this, thank you. I can't remember the last time I had peach ice cream. Mmmm. Must get some! Your boys are so adorable! That's it. I'm buying ice cream and raising my cone toward heaven tonight, giving thanks for you and your cricket and your boys with the skinned knees. your words, your boys, your insights,your love. While you're giving thanks for peace ice cream and the brothers enjoying it, I'm just thankful for you. Oh, your boys are beautiful 🙂 I read your comment on FPFG's blog – the answer is NO! It's wonderful! I can see why you why you might like to keep the summer feeling… Blessings!